The WGT team wishes you happiness and peace this holiday season. Take care of yourselves, and others. Happy holidays! Congratulations to the following recent tournament winners. There are new tournaments every week, but you have to play to win! WGT players from 170 countries have now completed 2 million rounds and hit 20 million golf balls since October. We'll keep the features, prizes and tournaments coming, so keep playing and thanks for all your support! The 2008 Crunchies is TechCrunch's second annual competition to celebrate the most compelling startups, internet and technology innovations of the year. Help us get WGT nominated for a "Best Time Sink Site" Crunchies award! Like to play WGT? Fan us on Facebook! 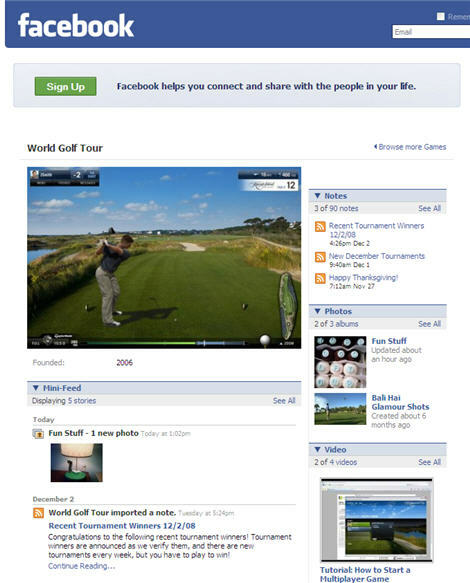 The WGT group on Facebook is another great way to stay in touch and interact with the WGT community. To join, click here. We've updated the Buy Credits page to make it easier to find and understand. 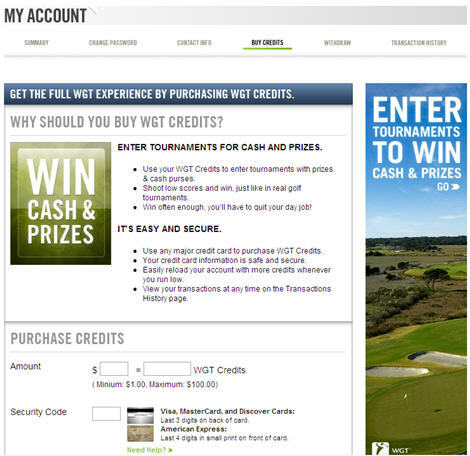 WGT is free to play, and we also feature free weekly and monthly tournaments. For players who want to win big prizes, we have tournaments that have an entry fee, usually ranging from $1 (100 credits) to $5 (500 credits). The new page is easy and secure, and gets you into the tournaments with the awesome prizes!